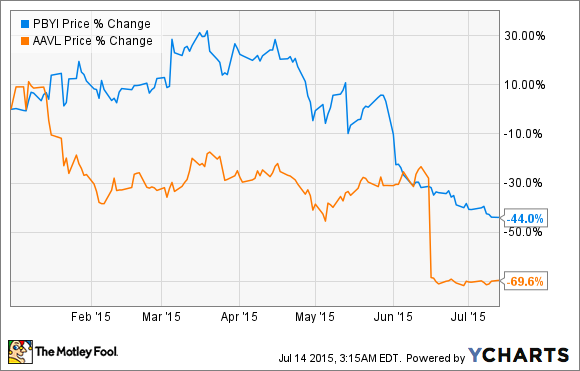 These 2 Biotech Stocks Cratered in 2015 -- Is 1 Now a Buy? Avalanche and Puma Biotechnology have seen their share prices plummet in 2015. 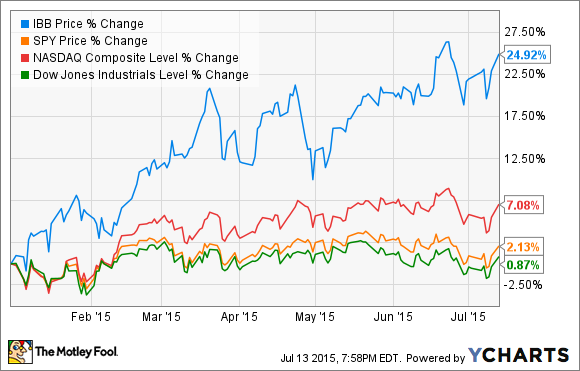 Are either of these cratering biotechs worth the risk? As biotechs can rally at the drop of hat, though, these two stocks may actually be a good place to look for outsized gains going forward. Armed with this insight, let's consider the turnaround prospects for these two companies heading into the back end of the year. Not too long ago, Avalanche saw its shares appreciate nearly 400% from its IPO price of $17. After somewhat disappointing, and certainly confusing, results last month emanating from its closely-watched gene-therapy drug, AVA-101, for wet age-related macular degeneration, the biotech's share price has now fallen almost 70% year to date. Avalanche's collapse was triggered by the release of top-line data for AVA-101's midstage trial in wet AMD, where the therapy actually met its primary endpoint of maintaining visual acuity with fewer anti-VEGF injections. The funky part is that patients receiving AVA-101 saw their retinas thicken relative to the control group -- a finding that doesn't jibe with the hypothesis that AVA-101 is providing a therapeutic benefit. To top it off, management announced immediately following the top-line data release that the study wasn't powered to examine efficacy, leading to even more confusion among Avalanche's bewildered shareholders. Since then, Avalanche has basically maintained radio silence as the lawsuits have piled up and everyone waits for Regeneron's decision on whether to license AVA-101. Avalanche thus looks like a pass, at least until some of the uncertainty about AVA-101 is off the table. The stock's recent nosedive began last May after the company presented neratinib's latest clinical data in the extended adjuvant setting for HER2+ breast cancer patients at the American Society of Clinical Oncology meeting in Chicago. Basically, neratinib only slightly edged out the placebo by 2.3% in terms of improving disease-free survival, while also inducing severe diarrhea in around 40% of patients. Even after using anti-diarrhea medications, investigators reported that about 17% of patients still experienced severe bouts of diarrhea when taking neratinib. All told, Puma is developing neratinib across a wide variety of indications, but it also hasn't exactly blown the doors off when it comes to showing a clear-cut clinical benefit relative to its risks. That's why this stock could continue to fall like a knife in the near term. Are either of these former stars worth the risk? While it wouldn't be surprising if both Avalanche and Puma ended the year on a high note, there are simply too many other biotechs out there with far less risk right now. So, it might worthwhile to keep an eye on these former high fliers in case something changes, but they're probably best left out of your portfolio for the time being.